NAYPYITAW — The Ministry of Religious Affairs and Culture has ordered monasteries in Naypyitaw and Mandalay to correct statues of the Buddha with mudras, or ritual hand gestures, that go against Theravada Buddhist scripture or face legal action. Monasteries in Mandalay have agreed to correct their Buddha statues after the ministry asked them to do so through its Sangha Maha Nayaka township committees, said U Zarni Win, the ministry’s deputy permanent secretary. 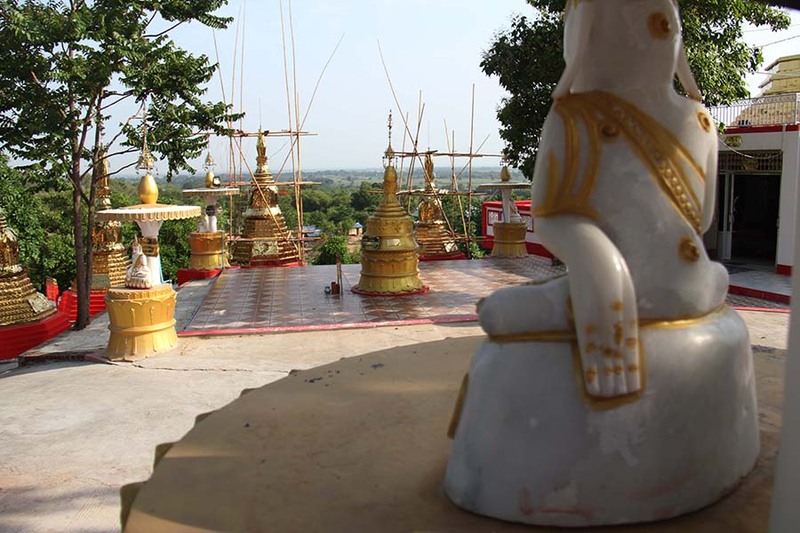 “As the township Sangha Maha Nayaka committees have advised, Buddha statues with those mudras are being fixed in Mandalay. And we’re also asking that they be corrected in Naypyitaw,” he said. Buddha images with unusual hand gestures had to be corrected at the Waibunla Rama Makhara Monastery in Mandalay’s Chanayethazan Township. “We’ve warned the sculptors who sculpted those statues, and also asked the concerned township Sangha Maha Nayaka committees to give advice to monasteries that accept such Buddha statues. If they ignore the order, we’ll take legal action under Section 295 (a) for insulting the religion,” he added. Article 295 (a) of the Penal Code says that anyone who deliberately insults someone’s religion or religious belief with words or “visible representation” will be punished with up to two years in prison, a fine, or both. Ashin Sandimarsara, the abbot of Seindamuni Monastery on Mt. Min Wun in Pyinmana, Naypyitaw, who has created Buddha statues with unusual mudras, told The Irrawaddy that the gestures date back to the Pagan Kingdom, which lasted from the 9th to the 13th century, and that people were criticizing him because they have not seen such gestures before. “They criticize me because they have no knowledge. I am fine with their criticism. They say there are no such gestures and that such statues are not Buddha images. They criticize for the position of the hand being put behind the back. I am not angry. Pyinmana residents have also filed complaints,” the abbot said. There are over 200 Buddha statues and stupas on the mountain. Many of them were donated by senior military officials including Thura U Shwe Mann, a former general who is now chairman of Parliament’s Commission for the Assessment of Legal Affairs and Special Issues. Other donors include military commanders, high-ranking government officials and large companies. The abbot said some officials from the ruling National League for Democracy also visit him. “Officials from the Religious Affairs Department have come and checked here. They are young and they haven’t seen the world,” Ashin Sandimarsara said. According to the ministry, there are 108 mudras on Buddha statues and that 57 of them are commonly used. Of the 57, 24 are in line with Theravada Buddhist scripture. Burmese traditional artists and historians said the function of the mudras was to help depict the life of the Buddha. “For example, the bhumiphasa mudra, a common mudra seen on many Buddha images in the country, represents the Lord Buddha asking the goddess of the earth to witness his enlightenment when he was threatened by the evil king,” said Tampawaddy U Win Maung, a Burmese traditional artist and historian. In the bhumiphasa mudra, the fingers of the right hand of the Buddha touch the ground while the left palm faces up on the Buddha’s lap. “The hand gestures seen in Naypyitaw and Mandalay are mixed up with Mahayana Buddhism, Hinduism and Yoga hand positions, which are not at all related to our Theravada Buddhism,” Tampawaddy U Win Maung said. He said Buddha images with the unauthorized mudras were created by bogus monks in the 17th century in Shan State and were later destroyed on the king’s orders. “I think the sculptors or the donors or the people who accepted these Buddha images do not understand the use of mudras and just want to use them as idols to change their karma,” he added. The Buddha images in Naypyitaw and Mandalay commonly have one hand behind the back and the other in front with the palm facing outward. “If the authorities plan to take legal action, they should do it seriously to stop the disgrace of Theravada Buddhism and the country’s culture, not just issue the order,” he said.